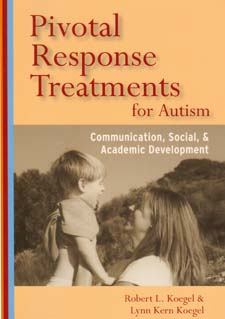 Pivotal Response Treatments for Autism: Communication, Social, & Academic Development by Robert L. Koegel and Lynn Kern Koegel. Pivotal Response Treatment uses natural learning opportunities to target and modify key behaviors in children with autism, leading to widespread positive effects on communication, behavior, and social skills. This book explains the intervention and details strategies developed by the program to enhance communication, social and academic behavior in children from preschool to elementary school. Pp. 296. This entry was posted in Interventions, Our Library, Uncategorized and tagged Autism Spectrum Disorder, books, Communication, social skill. Bookmark the permalink.